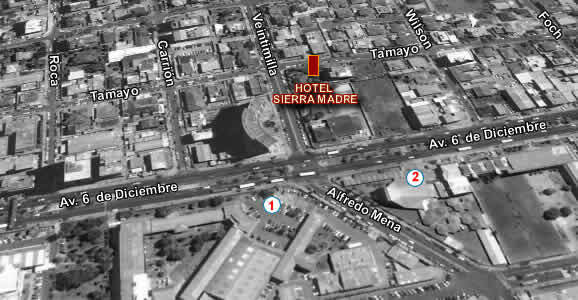 The Hotel Sierra Madre is located in a quiet area and close to Avenida Amazonas main tourist artery of the city. Due to its central location, from its surroundings will have access to a variety of Ecuadorian crafts shops, diverse restaurants, money exchange, museums, parks. It is 10 Quito Historic Center and 20 minutes from Mariscal Sucre Airport. The Hotel has a special atmosphere and different functions in a Spanish style villa that holds the colonial charm. The combined decorición Ecuadorian handicrafts and furniture, hand carved in fine wood of the country and make every corner a feature space of a memorable stay. Sierra Madre has 21 comfortably furnished rooms, all with private bathroom, telephone, television with cable TV and safe in the room. The Meson de Santa Ana will enjoy a selection of salads, seafood, meats and specialties a la carte.